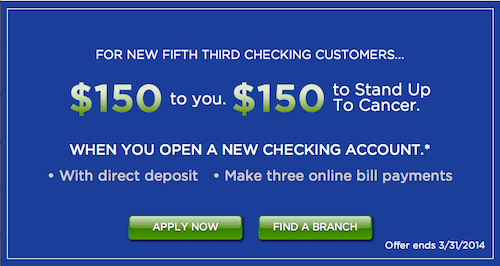 In a Q1 campaign called “Pay To the Order Of“, Fifth Third Bank will give $150 to each new customer who opens a checking account with direct deposit and makes three online bill payments and donate $150 to Stand Up To Cancer. A social component of the campaign asks individuals to share photos and stories on Twitter, Facebook, Instagram or Vine. Fifth Third will donate $1 for each eligible use of the hashtag. Fifth Third began its partnership with SU2C in 2013 with the launch of exclusive SU2C credit and debit cards, which direct donations to SU2C for every qualifying purchase. The ‘Pay to the Order Of’ campaign is a fully-integrated extension of the partnership reaching out to consumers via radio, in-branch, online, out-of-home and social media as well as TV (see spots here). Although it may be a stretch for consumers to make the connection between their bank and a cancer charity, the consistency and depth of the campaign solidly grounds this initiative, making it more relatable. Donations to date (including credit and debit card program) total $598,803.